The competition of the market of stand alone DVR and cctv camera is so intense that we have to try all the best to develop new design products with the best price and quality to survive. As we know, nearly all the economic 4/8 ch DVRs in the market is generally 4ch CIF or 1ch D1+3ch CIF realtime, while we have developed a new DVR board solution that support 4ch full channel D1 realtime but still even more economic than typically 1ch D1 + 3ch CIF DVRs, we do not sacrifice the quality to reduce the price , the secret here is that we use new design DVR board solution that reduced the cost largely. Here is our best pricr for H.264 4/8ch full D1 DVR and 16ch CIF DVR. Here is a detailed specification table for one of the 4ch full D1 DVRs. 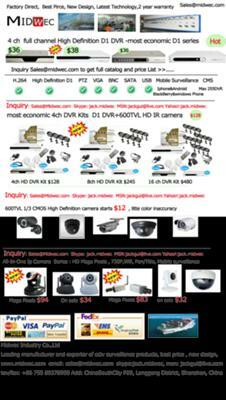 Our DVRs is very competitive in the market, but the most competitive product we have is not DVRs but DVR Kit! Because we not only have best price DVRs but also best price camera, and we have partner that manufacture cctv accessories, so we can get much better price for that than normal market price.